Any main model (or system) in 20-sim may be described as a composition of lower level submodels. These submodels themselves may again be described as a composition of lower level submodels etc. 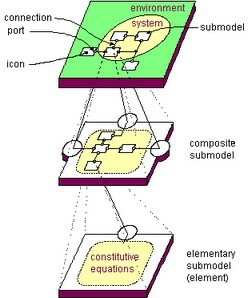 The lowest level consists of elementary submodels, which do not consist of submodels themselves. 20-sim supports hierarchic model. The lowest model in the hierarchy is always an equation model. You can inspect this in the Editor. If you click the Model tab at the left of the Editor, the Model Browser shows complete model hierarchy: a tree like structure showing all the submodels that are used in the model. The Model Browser at the left of the Editor shows the complete model hierarchy. To travel through the hierarchy, click any model in the tree. 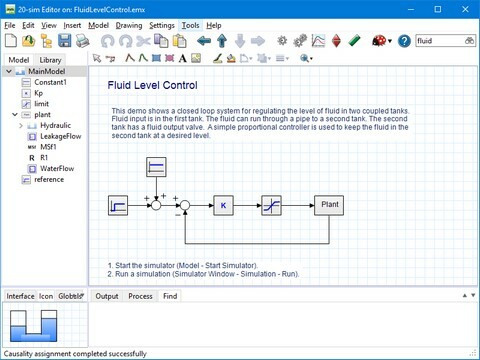 You can also select a model in the Graphical Editor and click Go Up or Go Down from the Model menu.